Bathroom remodels can be one of the most expensive rooms in your house flip! You will definitely want to update the bathrooms before you list your flip on the market, and these bathroom updates will make your listing sell even faster. When thinking of what tiles or paint colors to go with remember timeless is key. You don’t want a room that will be outdated in a years time! For a instant classic timeless look think clean. Neutral colors offer a clean classic look that can be played up or down with accessories. Gray, white and tan colors work wonders with other color schemes and offer a wide variety of choices when it comes to tile, paint, and accent pieces. It will update your room and make it easier to stage down the line when looking to list and sell! Once you have a classic theme for our bathroom, it’s time to add a little wow factor! Having a beautiful vanity will leave an impression on your listing and be a talking point for potential buyers. It can be as easy as sprucing up your mirror, adding a back-splash, replacing some finishes. However it never hurts to think about replacing an outdated countertop and creating a beautiful space. A show stopping vanity is a must have for a top selling bathroom. Don’t overlook lighting! No one wants to take a shower in the dark! You can boost your light easily, even if it means replacing old light fixtures with clean bright white bulbs, or possibly adding a small window. 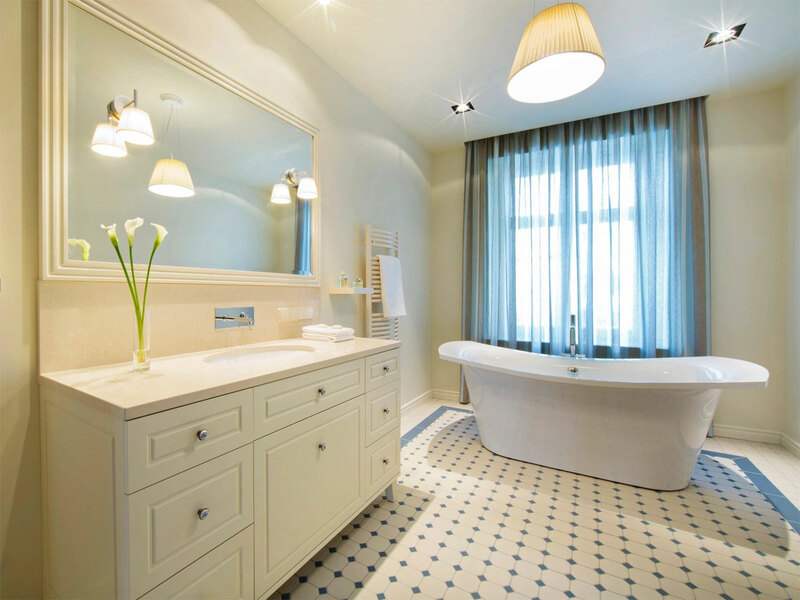 Having stellar lighting in your bathroom will leave a great impression on potential buyers, since they will use the bathroom every morning to put on makeup, or do their hair or shave? Bathroom Updates to modernizing the actual shower and bath are endless. The easier way to determine what kind of Update to make is to see the size of your room. See if you can have a separate bath and shower, or if you can only fit a shower, modernize the shower with clear shower walls and stunning finishes. Having a separate bath, maybe go for an additional wow factor and get a claw-footed bath, or even an extra wide bath that screams comfort. If you have a great bath and shower in place, consider a minor facelift with some new tiling that will make a killer impression on buyers. When investing in real estate, and house flipping, it can be tricky to get funding for your bathroom updates! Prime Plus Mortgages makes funding your flip easy so you can get your projects started faster! Prime Plus Mortgages helps house flippers and real estate investors, like you, in the Arizona and Scottsdale area get your property approved for funding in less than 24 hours! To learn more about how our fast hard money loan can be your investing dream come true, click here.